2 - 3.............Fred von der Blütenstadt d'Orsoy. 5 - 5,5..........Lump von Hagenstolz. 1981: 96-97-99 = 292 points (3rd). 1980: 100-95-94 = 289 points (1st). 1979: 97-93-98 = 288 points (5th). Flax vom Kirchbühl was the winner of the D.V. 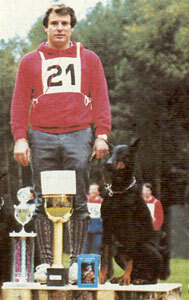 Meisterschaft in 1980 with 289 points and placed third in 1981 with 292 points. He was also Landesmeister of Landesgruppe Bayerischer in 1979 and 1982. His sire, Falk vom Rotbachtal, was used extensively as a stud dog and passed the Körung 'for life' with highest rating for hardness and working drives. Cliff vom Kirchbühl: SchH 3 and passed the Körung with Körklasse 1A rating. He sire of the von Hochstede “A, C” litters (Armin, Conny, Cora). Cora vom Kirchbühl: SchH 3 and sire of the vom Kirchbühl “I, K, M” litters (Ilo, Kuno, Kustos, Muse). Esta vom Kirchbühl: SchH 3, FH and passed the Körung with Körklasse 1A rating. She is dam of the vom Hause Ehrlich “A, B, C, D” litters (Beatrix, Bärbel, Bianca, Daniel).